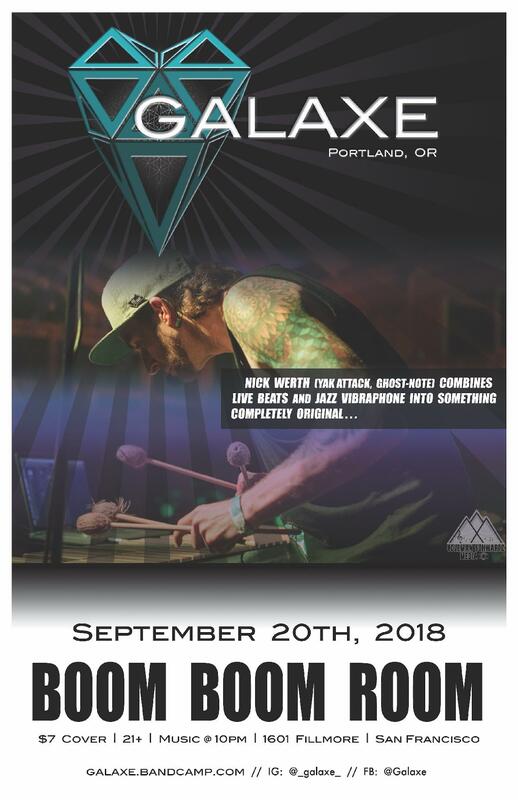 "Nick Werth (Yak Attack, Ghost-Note) combines live hip hop and jazz vibraphone into something completely original with his project Galaxe. Influenced by the swagger of J Dilla and the creativity of Flying Lotus, Nick uses a futuristic vibraphone to play his beats live." "Nick Werth (Yak Attack, Ghost-Note) serves up hip hop-inspired beats with his solo project, Galaxe. What makes this incredibly unique is that he does it all live using a futuristic vibraphone. Based in the Pacific Northwest, the Galaxe sound is deeply inspired by nature and psychedelic experience, with nods to J Dilla and Flying Lotus. An original touring member of Ghost-Note (Nate Werth and Robert "Sput" Searight of Snarky Puppy), Galaxe is featured on their first album, Fortified. He has collaborated with Daru Jones (Jack White, Talib Kweli), paying tribute to legendary hip hop producer J Dilla with a live remix set. The first Galaxe beat tape is in the making, slotted for late 2018 release." completely original with his project Galaxe. Influenced by the swagger of J Dilla and the creativity of Flying Lotus, Nick uses a futuristic vibraphone to play his beats live." remix set. The first Galaxe beat tape is in the making, slotted for late 2018 release."